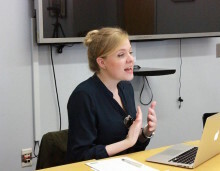 On April 22, 2016, the NYU Jordan Center for the Advanced Study of Russia welcomed Philippa Hetherington from the School of Slavonic and East European Studies, University College London for a session of the Spring 2016 Colloquium Series. The event, titled “Between Moscow, Geneva and Shanghai: the Traffic in Women of Russian Origin and the League of Nations’ Global Governmentalities, 1920-1937,” gave Hetherington the opportunity to discuss a paper devoted to the interaction between the League of Nations and the lives of Russian and Soviet female migrants in the interwar period. In many cases, this relationship led to anti-trafficking campaigns in order to rescue women of Russian origin engaged in prostitution in China. After being introduced by Anne O’Donnell, Professor of History and Russian and Slavic Studies at New York University, Hetherington explained how her article is part of a larger research project: a book at present titled “Circulating Subjects: The Traffic in Women and the Russian Construction of an International Crime.” “Narrowly defined, the focus of the book is on the emergence and the evolution of the idea of trafficking in women between 1880 and 1935 as a kind of identified social problem and a question in international criminal law, in Russia and in the Soviet Union” Hetherington said. The speaker explained that her work sets out to analyze the category of traffic in women, exploring how the domestic politics of sexuality and the politics of migration were mutually articulated during the period under examination. Providing a quick historical overview, the scholar noted that human traffic as a recognized social problem emerged in Russia in the late imperial era, and was followed by the appearance of a Russian anti-trafficking movement. The Duma criminalized the practice shortly after, introducing a specific article in the criminal code in 1909. The legacy of earlier conversations on the trafficking survived the Bolshevik revolution and informed Soviet attempts to eradicate prostitution later on. Hetherington pointed out that one of the most interesting aspects of the discourse on trafficking in the imperial and Soviet contexts was the “vernacularization of humanitarian discourses,” which produced a particularly autocratic rhetoric of what was then a global language of anti-trafficking activism. In particular, both state and non-state actors placed heavy emphasis on border security. “Essentially I look at how discussions about emigration and about movement across the border dovetail and bolster these anti-trafficking efforts and vice versa,” Hetherington said. Discussing her article in more detail, Hetherington said her work attempts to tackle the interaction between an “internationalizing biopolitics” and “global governamentalities,” interpreted in the the Foucauldian sense as “the rationalities that blend sovereign powers with newer disciplinary powers over individual bodies and biopolitical regulations over a population.” She highlighted that in the interwar period, governmentalities aspired to go beyond national or imperial terrains in order to intervene in the lives of apparently “stateless subjects.” For example, in the early 1930s, women of Russian origin were identified as the largest case of stateless subjects by the League of Nations, which submitted enquiries related to their trafficking in the East. Subsequently, Jordan Center Director Yanni Kotsonis asked how class fit within the discourse. The speaker replied by pointing out how the victims, many of whom were falsely represented as educated, aristocratic women, was instrumentalized by the League to garner sympathy for them. In fact, many of the women belonged to the working class. Bruce Grant, Professor of Anthropology at NYU, invited Hetherington to engage critically with the notion of anxiety as a driving force behind the efforts of the anti-trafficking movement. He cited Gayle Rubin’s article “The traffic in Women” as a useful source, which articulates the phenomenon as an expression of homosocial structures. Other questions delved into the dissonance between reality and the presentation of the anti-trafficking discourse, the Chinese context, and the selective intersection between race and the presentation of prostitutes as victims or criminals.